This is a guest post by Joseph Weissman. By endorsing Gilad Atzmon’s new book, The Wandering Who, John Mearsheimer heaps praise upon the racist writings of an antisemite who argues that Fagin and Shylock accurately represent Jewish evil, and that Hitler could be proven right. Stephen Walt allowed Mearsheimer a guest post on his Foreign Policy blog, to defend himself from “smears” suggesting Mearsheimer had endorsed an antisemite. Goldberg refers to a blog post that Atzmon wrote on March 25, 2010, written in response to news at the time that AIPAC had “decided to mount pressure” on President Obama. After describing what was happening with Obama, Atzmon notes that this kind of behavior is hardly unprecedented.In his words, “Jewish lobbies certainly do not hold back when it comes to pressuring states, world leaders and even superpowers.” There is no question that this statement is accurate and not even all that controversial; Tom Friedman said as much in the New York Times a couple of weeks ago. In the second half of this post, Atzmon says that AIPAC’s behavior reminds him of the March 1933 Jewish boycott of German goods, which preceded Hitler’s decision on March 28, 1933 to boycott Jewish stores and goods. His basic point is that the Jewish boycott had negative consequences, which it did. Writing days later in Foreign Policy, David Rothkopf deconstructed Mearsheimer and Walt’s backing of Gilad Atzmon. A professor at the University of Chicago, Mearsheimer has given his academic endorsement to Atzmon. To date, there has been no official reaction from the University of Chicago. Universities have a duty of care towards their students, and the university campus should be safe for Jews. The University of Chicago is clearly a safe environment for Jewish students. Yet two U. Chicago professors are now dismissing anyone concerned about the antisemitism of Gilad Atzmon, as anti-freedom and anti-intellectual. There is no reason to condemn Mearsheimer based on Atzmon’s previous controversial comments. The only acceptable criticism would be if he could prove that The Wandering Who? is itself anti-Semitic, and that Mearsheimer is guilty of praising those hateful elements. Goldberg does no such thing. However, by far the worst comment Atzmon has ever come out with, is found on p.179 ofThe Wandering Who. Atzmon is trying to prove, that there are scenarios which may well prove Hitler had the right idea all along. In Atzmon’s scenario, Israel goes to war with Iran, and some Iranian survivors of Israeli attacks conclude that “Hitler was right”. They are bold to do so. For Atzmon, this is just one scenario in which “the imaginary future can re-write its past” – and future events could justify Hitler. Atzmon is arguing that eventually, the terrible behaviour of Israel will cause some people to realise that Hitler might have been right after all. But for now, alas, the “Holocaust religion” prevents us in the present from realising this. I think we should commend anyone who seeks to push the boundaries and uncover the difficult truths, particularly when the questions are so messy. I am not saying I agree with Mearsheimer’s opinions on these issues: I don’t even know all of them. But I don’t care. For probably the first time since coming to this University, the words “academic freedom” mean more to me than justifying questionable investment practices. Atzmon may very well be an anti-Semite, but John Mearsheimer is not. How is it “academic freedom” to endorse a racist book? How is it “pushing the boundaries”, to suggest that Israeli evil couldl eventually prove to the world that Hitler was right all along? Why should Mearsheimer commend such a work? How would we feel about someone endorsing Mein Kampf itself – would we say they are being edgy, and making the full use of their academic freedom? Or would we say they are knowingly pushing a racist text? Slowly fear and the Marxist weapon of Jewry descend like a nightmare on the mind and soul of decent people. Now begins the great last revolution. In gaining political power the Jew casts off the few cloaks that he still wears. The democratic people’s Jew becomes the blood-Jew and tyrant over peoples. In a few years he tries to exterminate the national intelligentsia and by robbing the peoples of their natural intellectual leadership makes them ripe for the slave’s lot of permanent subjugation. Atzmon channels Hitler, plays down the racism of Mein Kampf, and argues that a nightmare scenario involving Israeli evil could eventually prove Hitler right. Mearsheimer and Walt then channel Atzmon, arguing that his book is “fascinating” and “Jews and non-Jews alike” must read it. Modernity over at Modernity Blog asks the following with regard to Baroness Tonge’s patronage of The Palestine Telegraph and the fact that it’s front page contains a rant by former KKK Grand Wizard, David Duke. HT to Modernity Blog and HP. UPDATE : According to Matthew Harris at the JC blog, Jenny Tonge has emailed the Palestine Telegraph to say that she no longer wishes to be a patron and wants her name to be removed from their website”. The David Duke video has been taken down. At the moment George Galloway is now listed as a patron. 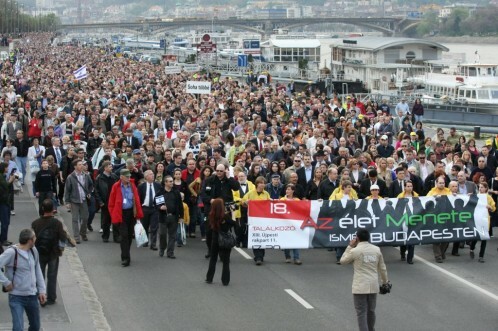 The Budapest March of Life : commemorating the Holocaust. Even before I read the article describing the event my first thought was that it was really remarkable that this commemoration managed to attract several thousand people while all other demonstrations organized lately by left-liberals were very small. Only a few hundred people took the trouble to raise their voices against intolerance and the visible growth of the far right. And behold, here is this huge crowd. Maybe it means that in the future we will see more vigorous political participation on the part of the left. The march was obviously more than a commemoration of the Holocaust. It was also a demonstration against the growing Hungarian Nazi movement. Because, let’s face it, it is a Nazi movement although in Hungary most people don’t dare to label it as such. When I wrote an article in Hungarian about the international reaction to Jobbik and mentioned that foreign commentators call them fascists, my editor wrote back expressing her hope that I could footnote that claim because otherwise Jobbik will sue the paper. Although there were several speeches the most interesting was the one given by Sándor Németh, head of the Hungarian chapter of the Assembly of God. [Hit Gyülekezete KP] This church is a very curious phenomenon. One would think that it would be politically conservative, but …[they] are a liberally minded lot and the church has long been associated with the liberal party. For instance, ATV, a liberal television station, is owned by the church. Most commentators noted approvingly that Sándor Németh at last didn’t mince words and called Jobbik what it is, a neo-Nazi party. It is the shame of Hungary, he continued, that members of this party will be sitting in the Hungarian parliament. And, yes, the Jobbik parliamentary members will be sitting in the very same chamber where the laws against the Jews were enacted in the late thirties and early forties. I am happy to report good news from Hungary and I am proud to be for many years the Vienna correspondent of „Hetek“ the weekly of „Hit Gyülekezete“. This Budapest paper whose chief editor is Sándor Németh takes in every issue a stand against racism and antisemitism and is a staunch advocate for Hungarian-Israeli friendship. This is a guest post by Karl Pfeifer. Karl has translated an article from www.galamus.hu/. Not yet rotten to the core. People adapt themselves to circumstances. Sooner or later everyone is forming a strategy on how do deal with today’s continuous anti-Semitism and anti-Ciganizm. Somebody opens his mouth and you do not want to believe your ears. That’s what started about seventeen years ago. You’re shocked and try somehow to get things straightened out. When you succeed you’re calm and in times like these you have a good one or two-liner ready for any eventuality. And sometimes you can even shame the foul-mouthed fellow and leave him perplexed and speechless. Say you go to the coffeehouse and see a table where they’ve made anti-Semitic remarks for quiet a time. The people look so cheerful and happy that you’d almost like to be part of them. They might even push out a chair with a spontaneous inviting move. So you interrupt and state calmly: Please be so kind to stop the anti-Semitic remarks, this is a public space and we’re in Europe. Until now this trick has just failed once. When somebody asked me, pointing to the cover of a magazine: “Is this journalist a Jew?” – I asked reflexively whether he was registering Jews, to which he menacingly replied “yes”, which is the conviction of a man who has just found his vocation. I was at a loss for words. He won. But that’s the only exception to the rule. However now we seem to have entered the phase of apathy. It happened in the changing room of a swimming pool – now shared between men and women, with little cubicles for the ultimate change of clothes. There is always a slightly frivolous atmosphere. A woman in a bikini feels naked amid men with scarves and overcoats. While I redid my eye-make-up I saw about seven-eight men getting undressed and chatting at both ends of a long bench. They could have come from the same place of work; they could have been an organized group. I received some appreciative looks for the make up of my left eye, but more exciting was the amusing short man who talked to them. A story about himself in the supermarket where he could not pay for the goods. He does not need to change his underpants for he has already put the swimming trunks at home. He just puts away his swimming cap and his towel and he starts to put things into the closet. – “Have you seen them? – Nope! I would have served them well me if I had seen them. These damn gypsies should be shot into the Danube like the Jews at the time. Then we would have order here“. The communication of an almost naked man with moles in the warm, always steamy and snug dressing room. This is not just everyday anti-Semitism and not just everyday anti-Ciganism, this is something very different, something I can’t classify. While it is true that you can make anti-Semitic, anti-Gypsy remarks openly and with impunity, the direct wish to kill is shocking. I have no one- or two liners to deal with it. The best I could muster in such situations was a “stop it!” but what should the man stop? His wish to kill? But I feel as ridiculously dumb standing there. Interestingly all the others are silent too. Nobody is curious what happened to his full shopping-basked, how he solved the problem of payment. The storyteller has finished with his dressing and goes to the pool. He stands up with some difficulty, he has a stick with him. “Kiss your hand, see you again“, he greets me in passing. Then walks past the dressing-room attendant. A young boy who sighs deeply, and then says to the short fellow and to nobody in particular: “And the time has come” – the slogan of the Fidesz-party that just won the election. Our country is not yet rotten to the core. New anti-BNP blog, BNP Facts. This is a guest post by Doerte Letzmann. Every year on February 13th and 14th, Germans commemorate the bombing of Dresden by the allied forces in 1945. Usually there is an official memorial at the ‘Heidefriedhof’, a cemetery in the outskirts of Dresden. This year on February 13th , Dresden’s mayor Helga Orosz and Saxony’s prime minister Stanislaw Tillich spoke to the 200 mourners and laid a wreath in commemoration of the dead. Like in the years before, this event was also attended by several neo-Nazis, for example by members of the NPD, the main far right party, and of the neo-Nazi organisation HDJ. In the evening of Friday February 13th, around 2500 people gathered around the ‘Frauenkirche’ (‘church of our lady’) – which was burned out during the bombing and collapsed – to remember the people who died during the bombing. Around the same time, around 1100 neo-Nazis marched through the city with torches. Usually there is a major neo-Nazi demonstration to commemorate the bombing. This year on February 14th , about 6000 neo-Nazis – the highest number so far – from all over Europe came to march in Dresden. They listened to Wagner, symbolically laid down a wreath and carried placards saying: “allied bombing holocaust” and “historical truth brings intellectual freedom”. In their speeches they pointed out how the Allies “demolished an innocent city” and killed “hundreds of thousands of civilians”. In 2004 a commission of historians made clear that about 25000 people died during the bombings – far fewer than the number claimed by Nazi propaganda at the time and today’s neo-Nazis. It seemed necessary to highlight yet again how the city and its people were not that ‘innocent’: many of Dresden’s residents worked in war industries and the city was a communication and transportation hub. A broad alliance of democratic institutions and individuals – among them the confederation of German trade unions and members of the Social Democratic, Green and Left Party- called ‘Geh Denken’ (‘Go think’) that engages against right-wing extremism in Dresden organised a counter-demonstration, which was attended by 7500 people. ‘Geh Denken’ opposes the ‘exploitation’ of the remembrance event by neo-Nazis, the “distortion of history” and wants to send a “democratic signal” against right-wing extremism. The anti-fascist left is split over the possible counter-actions. The anti-fascist alliance ‘No Pasarán’, which was also part of ‘Geh Denken’ and doesn’t want to “let the nazis lie about history” staged an anti-fascist counter-demonstration that was attended by almost 4000 people. This demonstration was dispersed by the police and several protesters were arrested. The ‘Vorbereitungskreis Keine Versöhnung mit Deutschland’ (preparation group no reconciliation with Germany) however, opposed the abandonment of left-wing positions in favour of a mass mobilisation and pointed out that the collective mourning of German ‘victims’ characterises both the neo-Nazi demonstration as well as the official commemoration events and that both were staged in order to find a new German collective identity. ‘Vorbereitungskreis Keine Versöhnung mit Deutschland’ organised a rally and concert on Friday February 13th against the remembrance event the same night and demanded the abolition of such events in general as they are an attempt to revise history and turn people that were involved in the national socialist state into ‘victims’ and ‘innocent civilians’. They are clearly fighting an uphill battle. For Germans who yearn for a clear conscience, it is hard to be reminded of the simple fact that Hitler’s regime remained popular and the Germans remained loyal to it until its final hours. A ‘neutral’ German civil society did not exist in that sense, because the German reality of total war, ‘Volksgemeinschaft’ and ‘final solution’ required Germans to be either actively involved in what would now be considered war crimes and crimes against humanity, or to give an ideological approval to stay passive in light of this reality. Germany’s behaviour in the war, the crimes it committed, and the role of its civilian population were unique. Like in the speeches at the memorial at the ‘Frauenkirche’ on Friday evening, it is often claimed that ‘legitimate’ mourning for Dresden is characterised by a demand for reconciliation while neo-Nazi marches stand for revenge. The understanding that Germans in Dresden and elsewhere were ‘innocent victims’, however, seems to be an uncontested value that most Germans, neo-Nazis or not, share. This is not what Allied leaders thought at the time, nor is it what history teaches. The ‘innocent victims’ of Dresden is an historic construct collectively remembered every year so that Germans today can feel better about themselves.